Wow; that's awesome. I'd like to swipe it for my post-apoc game - are the other levels mapped too? This is the whole map. Three levels, Of course you can make any non-commercial use of it you like. I like this map. The details are a nice addition. They make it clear that this was an intentionally-designed space that was once used for a purpose. Anything a GM is not sure about, they can improvise around. 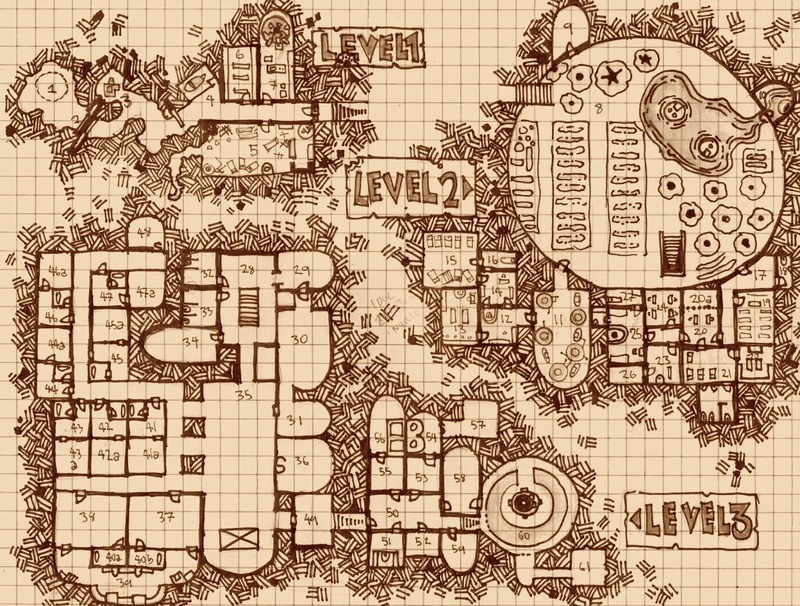 This came at a very fortuitous time, as I'm redrawing a few space fantasy maps based on our previous discussions. (For which: Thanks!) It's great to see other options, other approaches. It lends some perspective to one's own choices. Thanks GJ. It's funny because I worry this mp is too intentional. It's all choke points and sub regions, which could be very boring. I should have put more loops in. Choke-points get built into some installations for added on-site security, especially when expecting unwelcome visitors. You can always add-on vertically-connected sub-regions for each level, like crawlspaces, pits, chutes, Gygaxian sub-levels, etc. A few well-placed rifts, chasms, or collapsed wall-sections could also open things up, as could a large overlapping hole (or multiple holes) in the ceiling. A lot of the best encounters don't require elaborate or even 'fun' set-ups. Simple terrain or a few narrow passages, etc. can still be incredibly challenging locations...it all depends on what's in there, what's going on, if there's any prevailing circumstances (leaks, flooded sections, spills, weather, spell effects, radiation, etc.). 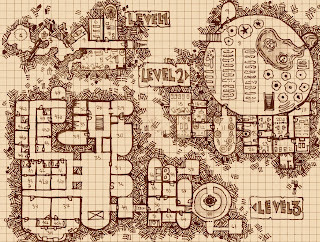 GJ - all that is true, and I don't think the map is bad as a matter of looking organic and rational, it's more that in the service of the organic and rational it lacks some of the elements that make good dungeon maps. Not a bad map at all. I rather like it. I like this map. While there are a lot of choke points, either 1) that is going to be because I use it as a military installation (at which point you would expect at least some of it) or 2) like garrisonjames suggested I would add a duct system layered on top. Crawlspaces are great for creating that claustrophobic, there's something in the dark dread for my players. Also, who's to say they cannot cut through the walls to make their own entrances?